Senior journalist and TV anchor Raza Rumi, working with Express News channel, escaped attempted target-killing on Friday (March 28, 2014) in what appears sequence of events targeting the country’s liberal media house since last year. 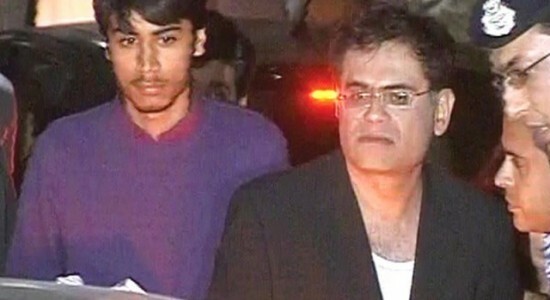 “With Friday evening attack on Raza Rumi we have no doubt that it was part of the campaign targeting Express media house for taking up issues concerning the public and defenders of human rights, freedom of press and freedom of expression,” Freedom Network [FN], Pakistan’s first media watchdog organization, said in press freedom alert on Saturday (March 29, 2014). “FN is relieved at safe escape of the journalist. However, the loss of his driver Mustafa is still a big loss and FN sends out condolence to the bereaved family,” the alert went on to say. The attempted murder bid on Raza Rumi comes after three staffers of Express News in Karachi were gunned down on January 17 this year and militant outfit Tehreek-e-Taliban Pakistan had claimed responsibility. Prime Minister Nawaz Sharif committed his government to defending press freedom in clearly defined terms during a meeting with delegation of New York-based press freedom defenders Committee to Protect Journalists in Islamabad on March 19. “The government should demonstrate also that what the prime minister has said will practically happen too,” FN alert hoped. The Pakistani press freedom organization urged Interior Minister Chaudhry Nisar Ali Khan to activate the two-member ministerial committee the prime minister has set up to look into ways and means to protect media and working journalists. Since its inception on January 18, there has been only meeting of the committee on February 4 in Islamabad. Raza Rumi is Lahore-based journalist having recently started political talk-show programme ‘Khabar Se Agay’ (Beyond The News) on Express News. He was attacked metres away from the channel’s office in Raja Market after doing the programme. TV footage showed Rumi was shaken by the assassination attempt. Rumi told Express News that doctors had termed his driver Mustafa’s condition critical. Mustafa succumbed to his injuries later in the hospital. Rumi himself received minor injuries from glass shards which flew at him when the windscreen of the car shattered. He said although he had not received any direct threats, he was reportedly on the hit-list of some extremist groups. “Was fired at near Raja Market… I was dreading this day,” Rumi tweeted soon after the attack. Police said 11 bullet casings were recovered from the crime scene, the capital city police officer (CCPO) told the media, according to Express Tribune. Although the incident appears to be an attempted target-killing, a clear situation will emerge after investigation, the police official added. Two investigation teams were constituted to probe the attack. Punjab Chief Minister Shahbaz Sharif has taken notice of the attack. “We [journalists] will continue to speak the truth and not back down,” Rumi said in an interview with Express News after the attack. Rumi said the relationship between citizens and the government would be irrevocably damaged if there is no sense of security in the country. “The first thought I had after the attack was how we have no security, no protection or guarantee,” he told Express News. “I thought of the thousands who don’t have any protection or contacts in the police and don’t get any media attention,” he said. Meanwhile, the Punjab Union of Journalists announced that it would hold a protest in front of the Punjab Assembly on Saturday. This is the fifth attack on Express Media group since August last year. Dec 2, 2013: Three people were injured when the Karachi office came under attack. Two hand grenades were hurled at the office building, while unknown assailants opened indiscriminate fire. Aug 16, 2013: Four armed men fired indiscriminately outside the entrance of the Express Media Group office in Karachi, injuring two members of staff, including a guard who is paralysed. Caption: A TV grab shows journalist Raza Rumi (R) after attack on him in Lahore on March 28, 2014.